Whether jellyfish numbers are increasing worldwide is an ongoing debate, but it is a fact that jellyfish-related problems such as clogged fishing gear and cooling water intakes, and tourists avoiding beaches, are increasing. 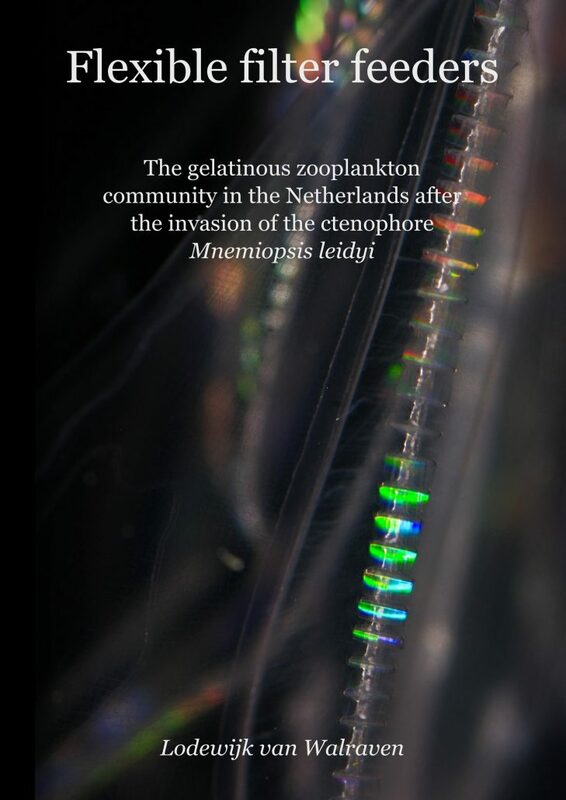 In Dutch coastal waters the introduction of the invasive comb jellyfish Mnemiopsis leidyi triggered a renewed interest in this diverse group of animals. In 2010 I started a study on gelatinous zooplankton in Dutch coastal waters, in a collaboration between the NIOZ Royal Netherlands Institute for Sea Research and Deltares. On November 18, 2016 I defended my thesis at the University of Groningen. Fifty years of jellyfish catches in a fish fyke on Texel show that jellyfish are appearing earlier in the year following warmer winters. The number of jellyfish caught had decreased. Polyps (bottom-living stages of jellyfish) were also studied and searched for on the bottom, on wrecks and in harbours and ports. Only polyps of the moon jellyfish were found. Knowledge of the distribution of polyps can lead to better forecasting of jellyfish problems in the future. The American comb jellyfish is now the most common gelatinous species in Dutch waters. Experiments showed that the species can survive in very brackish waters. Computer models of distribution, survival, reproduction and growth of the species predict that Dutch waters act as a source of comb jellies for other European waters. When coastal waters get warmer, spawning of the invasive species could increase and shift to earlier months. This can have consequences for food availability of other gelatinous species and fish such as anchovy, sprat and herring. A pdf of the thesis can be downloaded here.